I love an easy meal and this one is delicious! I made some simple wraps with BBQ chicken from my crockpot, cheese, tortillas, ranch, lettuce and grape tomatoes and they turned out really well. The whole family loved them and the kids enjoyed the small slices. 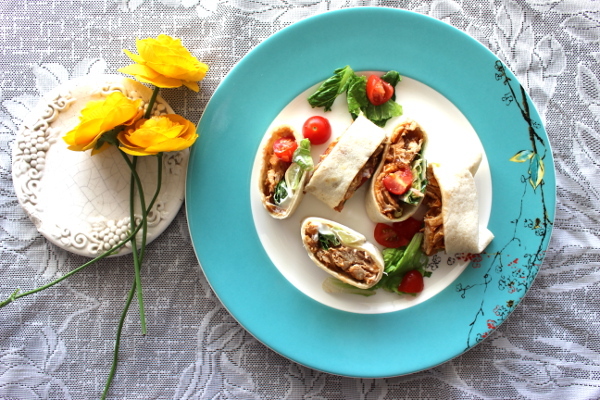 There are two simple steps to assembling these delicious wraps for your family. First, I started out by slow cooking some chicken in my crockpot for about 4 hours in the morning. Simply throw all three ingredients into your crockpot on high for 4-6 hours, until chicken is cooked through. Pull apart chicken with forks and turn off crockpot but allow chicken and BBQ sauce mixture to thicken in the crockpot. 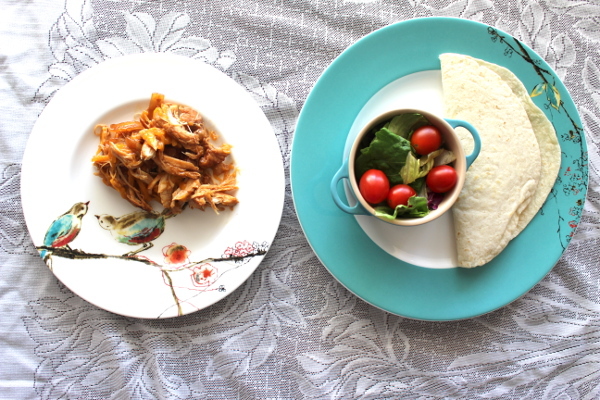 When the slow cooker BBQ chicken is finished you can gather the ingredients for the wraps make as few or as many as you like, there will be plenty of chicken even to save for leftovers if you are just feeding a few. Serve on a platter or individual plates and enjoy! Its pretty easy, hope you like it!